His middle-aged parents, Compagnonus de Guarutti and Amata de Guidiani, were childless until a prayerful visit to a shrine of Saint Nicholas of Myra at Bari, Italy. In gratitude, the couple named their son Nicholas. 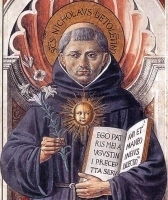 Nicholas became an Augustinian friar at age 18, and a student with Blessed Angelus de Scarpetti. Monk at Recanati and Macerata in Italy. Ordained at age 25. Canon of Saint Saviour's. There he received visions of angels reciting the phrase "to Tolentino"; he took this as a sign to move to that city in 1274, and there he lived the rest of his life. Worked as a peacemaker in a city torn by civil war. Preached every day, wonder-worker and healer, and visited prisoners. He always told those he helped, "Say nothing of this." Received visions, including images of Purgatory, which friends ascribed to his lengthy fasts. Nicholas had a great devotion to the recently dead, praying for the souls in Purgatory as he travelled around his parish, and often late into the night. Once, when severely ill, he had a vision of the Blessed Virgin Mary, Augustine of Hippo and Monica. They told him to eat a certain type of roll that had been dipped in water. Cured, he began healing others by administering bread over which he recited Marian prayers. The rolls became known as Saint Nicholas Bread, and are still distributed at his shrine. Reported to have resurrected over one hundred dead children, including several who had drowned together. Legend says that the devil once beat Nicholas with a stick; the stick was displayed for years in the his church. A vegetarian, Nicholas was once served a roasted fowl; he made the sign of the cross over the bird, and it flew out a window. Nine passengers on ship going down at sea once asked for the aid of Saint Nicholas; he appeared in the sky, wearing the black Augustinian habit, radiating golden light, holding a lily in his left hand; with his right hand he quelled the storm. An apparition of the saint once saved the burning palace of the Doge of Venice by throwing a piece of blessed bread on the flames. Fourth son of Sir Alexander Barlow and Mary Brereton. Baptized Catholic on 30 November 1585, he was raised as a Protestant, but as an adult he returned to Catholicism. Educated at the College of Saint Gregory, Douai, France, and the Royal College of Saint Alban in Valladolid, Spain. Benedictine in 1616. Ordained in 1617 in Douai. Returned to England to minister to covert Catholics in south Lancashire for 24 years. Unlike many of his brother priests, Ambrose was very open about his work, and was arrested several times. On 25 April 1631, just as he ended Easter Sunday Mass at Morley Hall near Manchester, England, he was arrested by an armed mob led by the local Anglican vicar. He was charged with the crime of being a priest, and freely admitted it. One of the Forty Martyrs of England and Wales. Daughter of Byzantine Emperor Arcadius and Empress Eudoxia. Her father died when she was 15, and she became regent of the empire on 4 July 414 until her younger brother Theodosius was old enough to rule. Pulcheria took special care of her brother's education, ensuring a strong religious background. She took a vow of chastity, and worked for religious reform and evangelization through the empire. When Theodosius took the throne, Pulcheria faded for a while into court life. She supported Pope Leo the Great regarding the Monophysite controversy, and when Theodosius married in 421, his wife convinced him to exile Pulcheria. 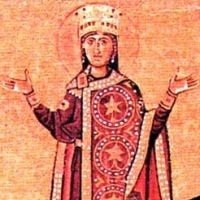 On the death of Theodosius, Pulcheria was recalled to be empress of the Byzantine Empire. She sponsored the Council of Chalcedon in 451, and supported the Church against the Nestorian and Eutychian heresies. Built churches, hospitals, hospices, and a university in the city of Constantinople. Descendant of Fiatach the Fair. 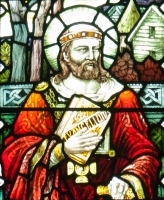 Studied under Saint Colman of Dromore, Saint Mochae of Noendrum, and the school of Saint Ninian. Pilgrim to Rome. Bishop of Moville, Ireland. Founded the monastery of Druim Fionn, and the school of Moville c.540. Composed a rule and penitential code for his monks. Spiritual teacher of Saint Columba. Spiritual student of Saint Remaclus at Malmédy-Stavelot, Belgium. Abbot of Malmédy-Stavelot in 653. Bishop of Maastricht, Netherlands in 663. Murdered by robbers in the forest of Bienwald near Speyer, Germany while on a journey undertaken in defence of his church. Celebration of the Blessed Virgin Mary as patroness of the Our Lady of Life Hospital in Bologna, Italy, and as depicted in a painting in a sanctuary dedicated to her c.1375 in the hospital. Benedictine monk at the monastery of Saint Mary of Mozonzo c.950. Abbot of Saint Martin of Antealares in Compostela, Spain. 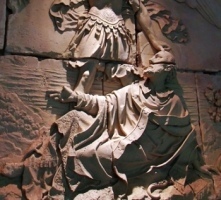 Archbishop of Saintiago de Compostela c.986. A leader in the Spanish Reconquista when the Moors were driven from Spain. May have been one of the composers of the Salve Regina. 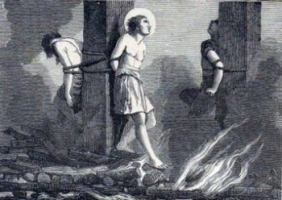 Arrested for theft, Nemesius was proved innocent, but in the process the authorities discovered that he was a Christian; scourged and executed with a couple of criminals in the persecutions of Decius. Martyr. Bishop of Avranches, France. Founded the monastery of Mont-St-Michel of the coast of Normandy, France after receiving a vision of Michael the Archangel. Executioner assigned to torture Saint Euphemia; her faith and prayers converted him to Christianity. Martyred in the persecutions of Diocletian. Spiritual student of Saint Grimbald. Bishop of Winchester, England, consecrated by Saint Plegmund. He served for 23 years, and noted for his care for the poor and a ministry of prayer for the recently dead. Bishop of Novara, Italy in 417; he served there for 30 years. First century hermit. Legend says that Barypsabas made a pilgrimage to Rome, Italy, carrying a container of the blood that flowed from the side of our Lord when He was on the cross. Martyr. 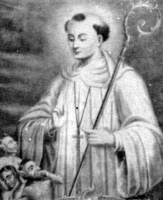 Son of Galla, who became a nun in later life, and Saint Eucherius of Lyon. Monk at Lérins, France. Bishop of Vence, France. Lawyer. Monk. Abbot. Hermit. Bishop of Albi, France in 574. Died while tending the sick during an epidemic. First century convert. One of the original 72 missionaries sent by Jesus himself. Bishop of Sardis. Martyr. Married lay woman and mother in Naples, Italy. 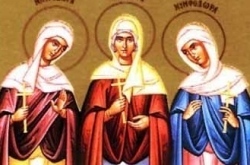 Three young Christian sisters martyred in the persecutions of emperor Maximian and governor Fronto: Menodora, Metrodora, Nymphodora. A unified feast to memorialize 205 missionaries and native Japanese known to have been murdered for their faith between 1617 and 1637. A group of Nicomedian martyrs, condemned for their faith to be worked to death in the marble quarries of Sigum. There were priests, bishops and laity in the group, but only a few names have come down to us: Dativus, Felix, Jader, Litteus, Lucius, Nemesian, Polyanus, Victor.